Stay in an historic atmosphere suitable for connoisseurs. Our house offers all the necessities for a relaxing visit. Many recreational activities await you here. A well-developed network of bicycle tracks and many beautiful footpaths start in front of the vacation house. The house is situated only 2 walking minutes from the historic market place where shops, restaurants, wine bars and others wait to be tried out by you. From April to October, a free city tour is organized by the Tourist Board every Thursday, starting at 3.30 pm in front of the Tourist Board (Gestade). Our family of 5 stayed here for two nights en route to Italy. We loved the location, right in the historic heart of Bernkastel, close to many shops and restaurants and within easy walking distance of the vineyard trails, the castle, waterfall and wine museum across the river in Kues. The house is picture perfect from the outside and very well appointed on the inside. We had everything we needed for a very comfortable stay. Thank you! We have only little impact on the "outside", which speaks for itself, but we try to keep the "inside" up to a standard matching the history of the house with modern comfort. Two families, each with one child. This property was a great location in the old town. The prebooked parking was a bonus as there is no parking near the house, so having parking nearby, off road and secure was great. We walked up the hill, visited the waterfall and castle, walked around town and went winetasting. Restaurants close by were great, awesome ice-cream shop in town, wifi was great and kitchen facilities enough for what we wanted. Even though we were so close to everything, it's still a nice, quiet location. The bench outside was great for sitting on to get out of the house and get some air. Two bathrooms were good to have for the two families. Kids were very happy with their shared room. It was very hot while we were visiting, and the upstairs room was incredibly hot, but an open window helped cool things down. It was great to have washing up liquid, dishwasher tablet, drying up cloths and towels, so we didn't need to travel with these things. Thanks and would stay again. Very pleased to read that you enjoyed your stay with us. We try to do our best to accommodate our guests in a house where they have as few as possible concerns to take into account, while the town itself and its surroundings speak for themselves. Hoping to see you at a next occasion. This is a nice, comfortable, centrally located house. Only a few minutes walk from the shops, restaurants etc yet very quiet. The beds were comfortable, it was well equipped and spotlessly clean. Unfortunately, there was no toaster and trying to make toast under the grill took forever. This is something that can be easily fixed though. Overall, we had a lovely stay and I would definitely recommend it. Many thanks for your kind evaluation of our vacation house. We try to do our best to combine the typical atmosphere and modern comfort and we are pleased that our guests can appreciate this. Sorry about the toaster. There should have been one and I don't know what went wrong here but I will certainly take care of this. Great house. All the modern amenities on the inside, quaint on the outside. Comfy beds, clean roomy bathrooms, quiet cobbled street. The owners were flexible, friendly and fast to respond. A minute walk to the baker, butcher, & grocer. The village is big enough to have a great choice of restaurants and shops, but small enough to feel as though you've entered another century. The kids would wander down to the baker in the morning, try out their German, and be back with lots of goodies. The reserved parking is a must with easy access to the highway. 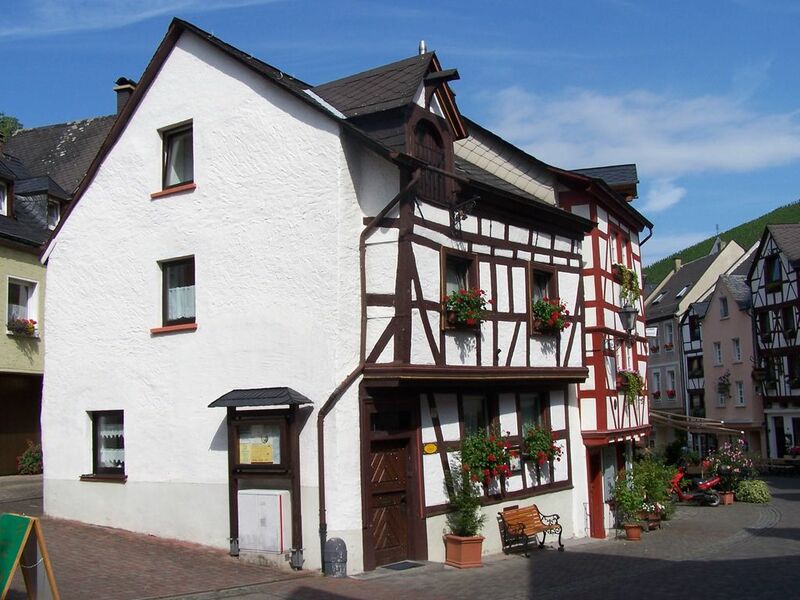 The house is 45 minutes from Berg Eltz and Historic Trier. Sehr ansprechende Wohnung auf 3 Etagen. In the little jewel of Bernkastel-Kues, a world full of romance awaits you. Experience the beauty of the picturesque landscape, with its vineyards, forests and river. Ski: Winter sport area Erbeskopf/Hunsrück (about 30 km from our vacation house). Ab 3 Personen / 2 Nächte ist der Mietpreis 75.00 Euro/Nacht für 2 Personen und 12.00 Euro/Nacht für jede weitere Person. Für 2 Nächte ist der Mietpreis 76.00 Euro/Nacht für 2 Personen und 13.00 Euro/Nacht für jede weitere person. Mietpreis für mitreisende Kinder von 3 bis 12 ist 6.00 Euro/ Nacht. Die Parkplatzmiete beträgt 6.00 Euro/ Nacht je Parkplatz.